From what you have asked, seems you just need to do a direct read. see my hierarchy and tell me how could i display data like that way. 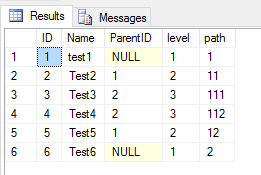 The way you framed the question and displayed the data from your table, it looks like the hierarchy is a straight read from the table. Is that not the case?